Dedryck Boyata: He returned to his home city looking to impress the “loads of family and friends” in the stand. The Belgium defender, recently returned from a knee injury, looked calm and confident in the face of expected pressure. Griffiths’ goal lit up a dreadful first half. The Scottish champions had played their part in an awful game until then but Olivier Ntcham sent Kieran Tierney down the left with an incisive pass and his cross was knocked into the net by the Scotland striker. From then on the Scottish champions did not look back. 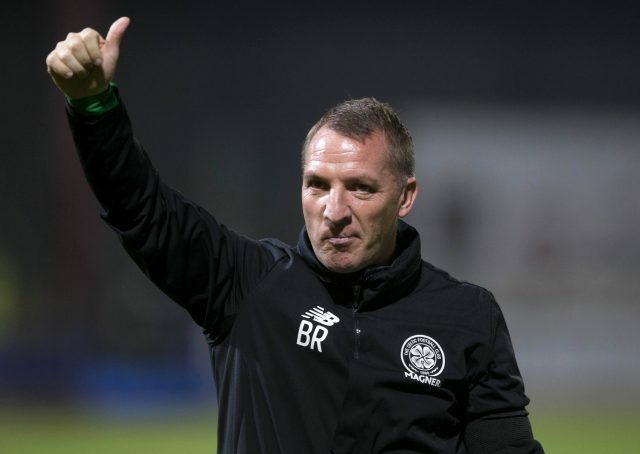 After a record 5-0 home defeat to Paris St Germain in match day one, Hoops boss Rodgers was keen to get some points on the board. The Northern Irishman would have wanted his side to perform better in the first half but will be delighted with the 3-0 win which takes the Hoops a long way to ensuring European football after Christmas. Anderlecht’s interim head coach Nicolas Frutos might just have said goodbye to his chances of getting the post on a permanent basis. Anderlecht: Frank Boeckx 6 (out of 10), Olivier Deschacht 6, Uros Spajic 5, Pieter Gerkens 6, Henry Onyekuru 6, Alexandru Chipciu 6, Dennis Appiah 7, Adrien Trebel 6, Leander Dendoncker 6, Lukasz Teodorczyk 5, Sofiane Hanni 8. Substitutes: Kara (on for Spajic 43) 5, Nicolae Stanciu (on for Deschacht 57) 5, Massimo Bruno (on for Hanni 70) 5. Celtic: Craig Gordon: 7, Mikael Lustig 6, Jozo Simunovic 7, Dedryck Boyata 8, Kieran Tierney 7, Scott Brown 6, Olivier Ntcham 7, Patrick Roberts 8, Tom Rogic 7, Scott Sinclair 7, Leigh Griffiths 8. Substitutes: Callum McGregor (on for Rogic, 66) 5, Nir Bitton (on for Brown, 70) 6, James Forrest (on for Roberts, 77) 5. Celtic v Hibernian, Ladbrokes Premiership, Saturday September 30. Anderlecht v Standard Liege, Belgian Pro League, Sunday, October 1.